It seems like most Australians can’t get enough junk food these days. A new study reveals that average Australians eat junk food every day, three times more than the recommended daily intake. By asking more than 40,000 respondents about their eating habits, Commonwealth Scientific and Industrial Research Organisation (CSIRO) gave Australia a failing score of 61 points out of 100. Taste can be deceiving. Despite its poor nutritional benefits, many people still indulge in eating junk food due to their pleasant taste. Junk foods were produced to stimulate one’s senses and taste buds, making you crave more. Most of them can be eaten right away without knowing how they are made. No matter how addictive these foods are, you must understand that unhealthy foods shouldn’t be a common staple in your diet and realise that you can break the junk food habit. Cheese proteins generate the pleasurable and addictive casomorphins upon digestion. Casomorphin is a protein fragment that makes you become addicted to cheese and other dairy products. Junk food seems so good as far as taste but it is definitely bad for your health. Junk food can increase the risks of prostate and breast cancer. They do not contain nutrients that are beneficial for your body. Trans fat, which is commonly found in baked goods, fried foods and packaged snacks, can lead to heart disease, liver cancer, stomach cancer and diabetes. With all these ill effects, you should be motivated by now to stop eating junk food, or reduce your cravings gradually until you are ready to quit it. List the foods you tend to crave. This list will act as a reminder about the foods you need to avoid completely. Write your reasons for quitting on a piece of paper. Look at it every single day and use it as a constant reminder of your goal. Make a list of fast food locations that serve healthy meals. This can help you prevent heading to the unhealthy fast foods when you find yourself hungry. Think about healthy foods that you like, the ones you can eat every day. Learn to control yourself. When you are tempted to grab junk food, remind yourself of the objective – why you want to quit. 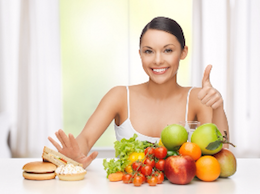 Ask your Trusted Gold Coast Chiropractor for Nutritional Advice today! For more tips on diet and nutrition, consult your reliable Gold Coast chiropractor here at Hinterland Chiropractic. Our chiropractors are trained in assisting you with nutritional advice and give their time weekly to hold informative classes, held at our clinic. Your trusted chiropractor in Gold Coast is committed to helping you and your family enjoy optimal overall wellness throughout your lifetime. Enjoy the wondrous health benefits of living the chiropractic lifestyle. Call us today on 07 5527 3133 or simply book your appointment online.